At Mt. Olive, we obviously know how to make great pickles. But we also work very hard to make a great Mount Olive. In fact, we take our community involvement quite seriously. Each year we contribute several hundred thousand dollars in cash and product donations. But we also offer the energy, enthusiasm and commitment of our people to make our community stronger. Mt. Olive the company and Mount Olive the community are closely intertwined. Our roots are in the efforts of local businessmen to accommodate a bumper crop of cucumbers back in the 1920s. Today, the company is by far the largest employer within the Town of Mount Olive, a small, Eastern North Carolina town with a population of 4,500. The community and the company come together each year in April to celebrate, through the N.C. Pickle Festival, a unique and truly dill-lightful relationship. It is a relationship we foster. We partner with our local schools, we sponsor youth recreation teams, we support fundraising efforts of local civic organizations. We contribute to national charities at work in our community. We support United Way of Wayne County, and through it, the agencies that provide services to residents here. a private, liberal arts college that serves traditional and non-traditional students in over 30 degree programs, through substantial financial contributions each year. Behind the university, our single largest beneficiary is the company’s Employee Community Fund. Established in 1959, the Employee Community Fund is managed by our employees, who determine distribution each year. Employee contributions are voluntary, but most Mt. Olive employees opt to have 30 cents of every hundred dollars of their wages directed to this fund. The company then matches employee contributions annually. This fund supports the Boys and Girls Club of Mount Olive, United Way of Wayne County, dozens of local volunteer fire and rescue departments, and national charities. In addition, in 1994 the company launched the Mt. Olive Pickle Company Foundation. Over the years, the foundation, among other contributions, enabled Friends of Steele Memorial Library to improve its offerings for library patrons in Mount Olive, helped bring the N.C. Symphony to Wayne County, and supported the efforts of the Mount Olive Area Historical Association and Mount Olive’s Habitat for Humanity. We are generous, too, with our pickles. We routinely donate our products and picklephernalia items for church and civic auctions, fundraisers and events. 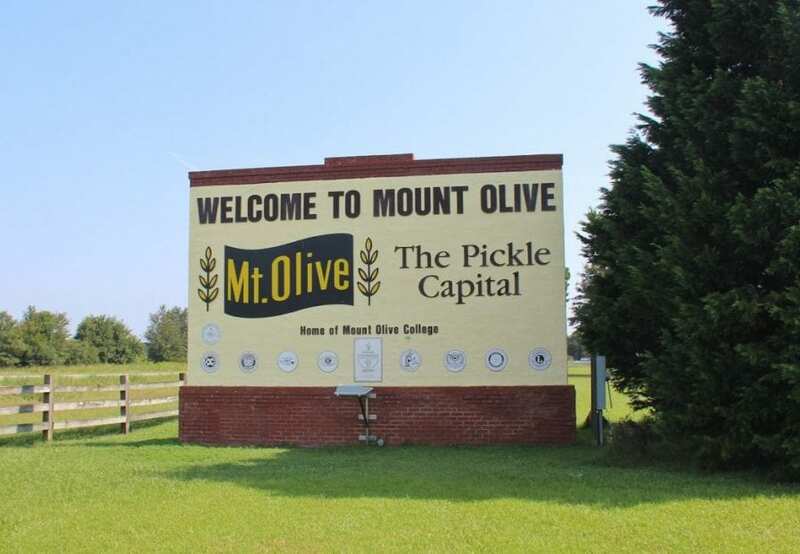 In fact, our local Chamber of Commerce president customarily offers guest speakers “payment in pickles” – our gift packs – when they visit Mount Olive. We are a major contributor to the Food Bank of North Carolina, supplying product for distribution to soup kitchens and meal programs around the state. Financial and product contributions are important, but we also offer the commitment of our employees, who volunteer for community, educational, church and civic organizations. That’s everything from the Mount Olive Area Chamber of Commerce to the Rotary, Lions, Exchange, and Shrine clubs. An example: our employees over the years have raised thousands of dollars for the American Heart Association by participating in the annual Heart Walk here. The list is truly endless, but only because we see community involvement as a vital part of what we do, day in and day out. And you thought all we did was make great pickles.